1 loaf whole grain bakery bread (about 15 - 18 inches long), sliced and cut into 1-inch cubes. **I discarded the ends. extra pure maple syrup for serving. In a medium to large bowl whisk together eggs, coconut milk, cinnamon, nutmeg, pure vanilla extract, and maple syrup. Lay out the bread in a 9 x13 baking dish lightly sprayed with cooking spray. Pour the egg mixture over top of the bread. Gently stir it together until all of the bread is coated with the egg mixture. Cover the dish with foil and place in the refrigerator overnight. In the morning, remove the dish from the refrigerator and place on the counter. Preheat oven to 350 degrees. In a small bowl combine almonds, brown sugar. and butter. Squeeze together with your hands until it forms a crumbly mixtures. Sprinkle it over top of the french toast mixture. Bake for 50 minutes. Serve hot or warm with more pure maple syrup, if desired. The recipe can be prepare the night before. 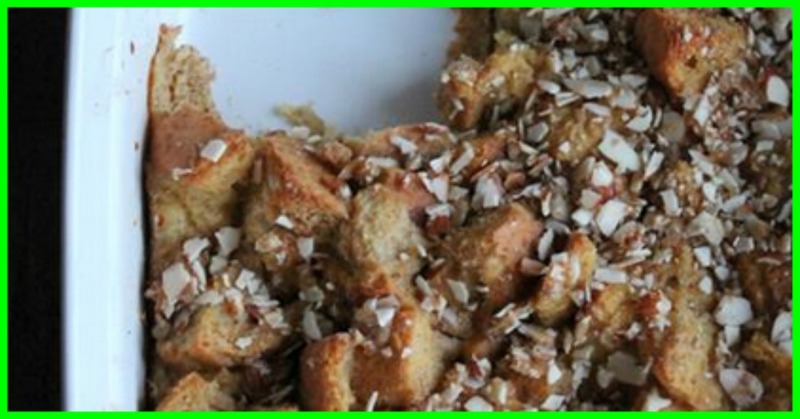 Continue with almond, sugar, and butter topping, place in the oven, and continue with recipe. After it is baked, cut into portions, and store in the refrigerator and/or freezer. Wrap in plastic wrap then place in to freezer bags. Or store in plastic containers.